Dr. Alinaghi Mirmoayedi is currently working as Professor of Entomology at Razi University, Kermanshah, Iran. He completed his PhD in 1977 in Entomolgy at Toulouse University, France. 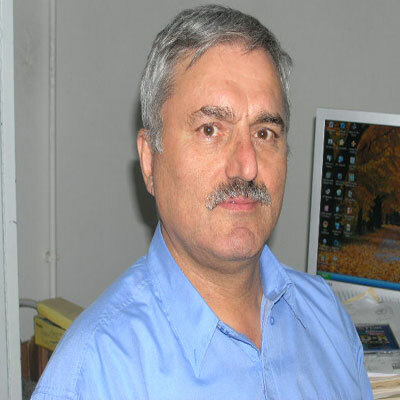 His prior work experience includes Assistant Professor in Razi University in Kermanshah and College of Agriculture, Department of Agronomy and Associate Professor at same university. He has published 7 academic books in Farsi language, and also published 78 papers in international journals and also proceedings of congresses. He is interested to work on agricultural entomology of his country, Iran and also very interested to study fauna of neuropteran of Iran and adjacent countries as well. He was awarded four times as distinguished researcher in Razi University, and also supervised the thesis of 20 MSc students in the past and now he is supervisor of three Ph.D students in the field of Agricultural Entomology. As an editor for five journals belonging to Science Alert group, since 2012 till 2015 he has reviewed more than 65 manuscripts for those journals of Science Alert, Pakistan. Rahimi, A., A. Mirmoayedi and M. Khanjani, 2014. Dispersion type of Varoa mite (Acari, Varroidae) among the bee hives in Kurdistan, Iran. Int. J. Farm. Allied Sci., 3: 225-259. Shirazi, M., H.A. Vahedi, A. Mirmoayedi, M. Masoumi and K. Jallilvand, 2013. Scale insects recorded on ornamental plants in urban areas of Kermanshah, Iran. Afr. J. Agric. Res., 8: 1381-1383. Rahimi, A. and A. Mirmoayedi, 2013. Evaluation of morphological characteristics of honey bee Apis mellifera meda (Hymenoptera: Apidae) in Mazandaran (North of Iran). Tech. J. Eng. Applied Sci., 3: 1280-1284. Khanjani, M., A. Firuzfar and A. Mirmoayedi, 2013. Cheylostigmaeus mahvashae sp. nov., a new species of the family Stigmaeidae (Acari) from Kermanshah province, Iran. Syst. Applied Acarol., 18: 345-350. Asadi, M. and A. Mirmoayedi, 2013. New records of neuropteran from Kermanshah province in West Iran. Proceedings of the International Conference on Insect Science, February 14-17, 2013, Banglore, India, pp: 93-. Sziraki, G. and A. Mirmoayedi, 2012. An annotated checklist of iranian Coniopterygidae (Neuroptera). Folia Historico Naturalia Musei Matraensis, 36: 45-50. Mirmoayedi, A., A. Zia and M.A. Rafi, 2012. New records of Mantispidflies (Mantispidae) from Pakistan. Pak. J. Zool., 40: 11712-11714. Khanjani, M., S. Pishehvar, A. Mirmoayedi and M. Khanjani, 2012. Two new eyeless mite of genus Stigmaeus Koch (Acari, Stigmaeidae) from Western provinces of Iran and description of male Stigmaeus pilatus Kuznetsov. Int. J. Acarol., 38: 504-513. Khanjani, M., A. Mirmoayedi, B.A. Fayz and T. Sharifian, 2012. Two new larval species of the genus Erythraeus (Erythraeus) (Acari: Erythraeidae) from Iran. Zootaxa, 3479: 52-68. Mohammadi, S., M. Arbabi and A. Mirmoayedi, 2010. Study on host range and distribution of Parasitengona mite larvae in Kermanshah province of Iran. J. Entomol. Res., 2: 117-126. Mirmoayedi, A., M. Maniee and A. Yaghutipour, 2010. Control of cotton spiny bollworm; Earias insulana Boisduval. Using three bio-insecticides, BT, spinosad and neem azal. J. Entomol., 7: 89-94. Khanjani, M., A. Mirmoayedi, A.R. Nahad and B.A. Fayaz, 2010. Two new larval species of Erythraeus (Acari: Erythraeidae) from Western Iran. Zootaxa, 2537: 19-32. Eradati, N., A. Mirmoayedi and H. Adldoost, 2010. Faunistic study of Myrmeleontidae and Ascalaphidae (Order Neuroptera) in west Azerbaijan province, Iran. Proceedings of the 19th Plant Protection of Iran, Iranian Research Institute of Plant Protection, July 31-August 3, 2010, Tehran, pp: 168-. Mirmoayedi, A., 2008. Morphological characteristics of larvae and imago of Myrmecaelurus trigrammus (Pallas, 1771) (Neuroptera, Myrmeleontidae) reared in laboratory condition. Iran. J. Anim. Biosyst., Vol. 4. .
Mirmoayedi, A. and M. Maniee, 2008. Integrated control of podborer, Helicoverpa armigera (Hueb) (Lep. Noctuidae) releasing Chrysoperla lucasina (Neuroptera, Chrysopidae) and treatment of insecticides. J. Entomol., 5: 322-327. Mirmoayedi, A., 2007. Records of three species of ant-lions (Neuroptera: Myrmeleontidae), new for the fauna of Iran. Zool. Middle East, 41: 115-117. Mirmoayedi, A., 2007. Checklist of the fauna of Iranian Antlions. Proceedings of the 13th Congress of the Russian Ent. Soc., September 9-15, 2007, Krasnodar, Russia, pp: 229-230. Mirmoayedi, A. and M. Maniee, 2007. Integrated control of spiny bollworm, Earias insulana (Lepidoptera, Noctuidae) by the use of diazinon spraying and green lacewing Chrysoperla lucasina (Neuroptera, Chrysopidae) release). Proceedings of the 13th Congress of the Russian Entomological Society, September 9-15, 2007, Krasnodar, Russia, pp: 134-. Mirmoayedi, A., 2006. Characteristics of larvae of antlion Myrmecealurus trigrammus (Pallas 1771) collected in Behesht Mustapha of Marivan (West Iran) and reared in laboratory condition. Proceedings of the 14th Iranian Biology Conference and the 2nd International Conference of Biology, August 29-31, 2006, Tarbiat Modares University, Tehran, pp: 213-. Mirmoayedi, A., 2005. Morphological details and life cycle of Chrysopa septempunctata Wesmael 1841, reared under laboratory condition. Proceedings of the 13th Iranian Biology Conference and the 1st International Conference of Biology, August 23-25, 2005, Rasht University, pp: 93-. Mirmoayedi, A., 2005. Food preference of green lacewing Chrysoperla mutatta in choosing two species of aphids; Schizaphis graminum and Aphis fabae (insecta, Neuroptera, Chrysopidae). Proceedings of the 13th Iranian Biology Conference and the 1st International Conference of Biology, August 23-25, 2005, Rasht University, pp: 90-. Thierry, D., M. Canard and A. Mirmoayedi, 2004. Chrysoperla mtata (MacLachlan 1898): Looking at alive adult, description of it's larva and some bioecological remarks (Neuroptera, Chrysopidae) Entomofauna, Zeitschrift fuer Entomologie. Band 25. Heft, 23: 345-356. Mirmoayedi, A., 2003. Rearing the third stage larva of Cueta luteola Hoelzel, 1972 (Neuroptera: Myrmeleontidae) for the first time in Iran. J. Zool. Middle East, 29: 101-104. Mirmoayedi, A., 2003. Description of the third stage larva of Cueta lineosa Rambur 1842 (Neuroptera, Myrmeleontidae) rearing for the first time in Iran. Khark. Ent. Soc. Gazett., 10: 122-123. Mirmoayedi, A., 2002. New records of Neuroptera from Iran. Acta Zool. Acad. Sci. Hung., 48: 197-201. Mirmoayedi, A., 2002. Forty years of studies by Iranian entomologists on the Chrysopidae fauna of Iran 1961-2000 (Insecta, Neuroptera). Zool. Middle East, 26: 157-162. Mirmoayedi, A., 2002. First rearing of Cueta lineosa (Rambur 1842) from the third larval stage in Iran (Neuroptera, Myrmeleontidae). Proceedings of the 12th Congress of the Russian Entomological Society, August 19-24, 2002, St. Petersburg, pp: 238-. Mirmoayedi, A., 2002. First parasitism of flesh flies Blaesoxipha sp. (Dip. Sarcophagidae) on the grasshopper Saga (Dip.Tettigonidae) from Iran. Proceedings of the 12th Congress of the Russian Entomological Society, August 19-24, 2002, St. Petersburg, pp: 239-. Mirmoayedi, A. and H. Malicky, 2002. An updated check-list of Caddisflies (Insecta, Trichoptera) from Iran, with new records. J. Zool. Middle East, 26: 163-168. Mirmoayedi, A. and D.Thierry, 2002. First report on the seven species, including two undescribed species at the population of the Chrysoperla carnea complex in Iran (Neuroptera, Chrysopidae). Proceedings of the 12th Congress of the Russian Entomological Society, August 19-24, 2002, St. Petersburg, pp: 240-. Mirmoayedi, A., 2001. Species of Neuropterans collected during the years 1999-2000 in different locations of Iran. Proceedings of the 10th Iranian Biological Conference, September 3-5, 2001, Shiraz University, Shiraz, Iran, pp: 50-57. Mirmoayedi, A., 2001. Release of eggs and larvae of Chrysoperla carnea for control of eggs and nymphs of cotton's spiny bollworm (Earias insulana). Proceedings of the 2nd Irano-Russia Agricultural and natural Resources Conference, February 1-2, 2001, Moscow Timiryazev Agricultural Academy, Russia, pp: 4-8. Marzbany, R., A.H. Bayat and A. Mirmoayedi, 2001. Comparative assessment of some biological characteristics of Indian meal moth Plodia interpunctella Hb. (Lep. Pyralidae) on pistachio, walnut in laboratory. J. Entomol. Soc., 20: 71-79. Mirmoayedi, A., M. Sharifi and Z. Hemmati, 2000. Megachernes pavlovskyi (Redikorzev, 1949) species of pseudoscorpion, first record from Iran. Proceedings of the 9th Iranian Biological Conference, August 15-17, 2000, University of Teheran, Iran, pp: 108-. Mirmoayedi, A., 2000. Neuropterans of different regions of Iran. Proceedings of the 14th Plant Protection Congress of Iran, September 5-8, 2000, Isfahan University of Technology, Isfahan, Iran, pp: 340-. Mirmoayedi, A., 1999. New investigation on the fauna of Kermanshah and Kurdistan Province in Iran. Proceedings of the 8th Iranian Biological Conference, August 30-September 1, 1999, Razi University, Kermanshah, Iran, pp: 234-. Mirmoayedi, A., 1999. Investigation of the neuropteran fauna of Shiraz (Insecta, Neuroptera). Proceedings of the 8th Iranian Biological Conference, August 30-September 1, 1999, Razi University, Kermanshah, Iran, pp: 233-. Yassayie, A. and A. Mirmoayedi, 1998. Collection and identification of Neuropteran fauna in Golestan National park. Proceedings of the 7th Iranian Biological Conference, August 22-24, 1998, Isfahan University, Isfahan, Iran, pp: 97-. Mirmoayedi, A., A.V. Zakharenko, V.A. Krivokhatsky and A. Yassayie, 1998. K faune etchatokril (Insecta, Neuroptera) Nasionalnyie parka golestan-e-provinsi Kermanshakh (Iran)in Russian language with English summary. Izvestia Kharkovskogo Entomologiecheskoe Obshestva, 2: 53-56. Mirmoayedi, A., 1998. New species of Iranian Neuroptera. Proceedings of the 13th Plant Protection Congress of Iran, August 23-27, 1998, Junir Agriculture College of Karadj, Karadj, Iran, pp: 250-345. Marzbany, R., H.B. Assadi and A. Mirmoayedi, 1998. A survey of the distribution of Bacillus thuringiensis in the soils of Kermanshah Province. Proceedings of the 13th Plant Protection Congress of Iran, August 23-27, 1998, Junir Agriculture College of Karadj, Karadj, Iran, pp: 239-345. Mirmoayedi., A., 1997. Chrysoperla carnea release for the biological control of safflower aphid (Euroleucon compositae) and safflower fly (Acanthiophilus helianthi). Proceedings of the 6th Iranian Biological Conference, August 25-September 27, 1997, Kerman University, Kerman, Iran, pp: 109-. Mirmoayedi, A., 1995c. A checklist of certain Neuropteroidea of Hormozgan Province. Proceedings of the 12th Plant Protection Congress of Iran, September 2-7, 1995, Junir Agriculture College Karadj, Karadj, Iran, pp: 345-. Mirmoayedi, A., 1995. Newly found distribution locations of the species of Neuropterans belonging to the Chrysopidae and Hemerobiidae families in Iran (Class Insecta, order Neuroptera). Proceedings of the 4th Iranian Biological Conference, August 29-September 31, 1995, Gorgan University of Agricultural and Natural Resources, pp: 33-. Mirmoayedi, A., 1995. New species of Neuropteroidea from Kermanshah Province. Proceedings of the 12th Plant Protection Congress of Iran, September 2-7, 1995, Junir Agricuture College of Karadj, Karadj, Iran, pp: 343-. Marzbany, R. and A. Mirmoayedi, 1995. Evaluation of the effectiveness of three dried fruits; Pistachio, walnut and Almond on larval and pupal life duration and adult fertility in the Indian meal moth (Plodia interpunctella). Proceedings of the 6th Iranian Biological Conference, August 25-September 27, 1995, Kerman University, Kerman, Iran, pp: 117-. Mirmoayedi, A., 1993. Collection and identification of Neuropteran species belonging to the families Chrysopidae and Hemerobiidae captured in different regions of the state Kermanshah in Iran. Proceedings of the 11th Plant Protection Congress of Iran, August 28-September 2, 1993, University of Guilan, Rasht, pp: 268-. Mirmoayedi, A. and A.K. Pakdel, 1993. Laboratory rearing of Chrysoperla carnea and Chrysopa septempunctata (Neuroptera, Chrysopidae). Proceedings of the 11th Plant Protection Congress of Iran, August 28-September 2, 1993, University of Guilan, Rasht, pp: 267-.